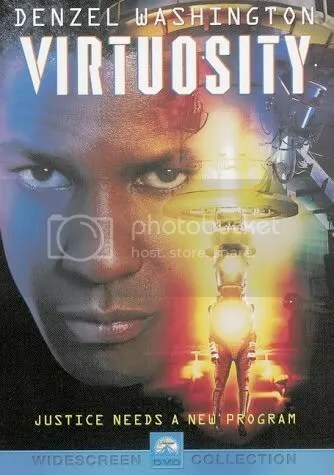 Virtuosity is about a virtual reality AI programmed to be a psycho killer (played by Russell Crowe) who is freed from the computer. He is given an android body that can regenerate any damage by nanobots. Former cop/now death row inmate Parker Barnes (Denzel Washington) knows the program best and is given a pardon in exchange for the program’s destruction. So by the synopsis it sounds a bit like a Terminator rip off and also a little lame. But this movie is actually kinda fun. It’s a movie that really doesn’t take itself all too seriously and embraces the cheesiness. It only wants to be a fun, dumb action movie and it does just that. I think the main reason for why I like it is the over the top acting. Denzel Washington is fun as a badass (just watch Man on Fire) and Russell Crowe chews city size scenery as the psycho killer. It works with Denzel playing the straight man to Crowe’s clownish killer. The story moves at a brisk pace, giving just enough characterization before moving onto another action scene. And while some of the movie is cliché, it is done in such a way to make it entertaining. This is just a fun little popcorn flick. Maybe on a slow night, you can give this a rental and enjoy it for the pleasant diversion that it is. I liked it when it first came out and I still enjoy it. A short review I know. But after writing two pages on how much Wing Commander sucked, I think for the purposes of this review its good to be brief.